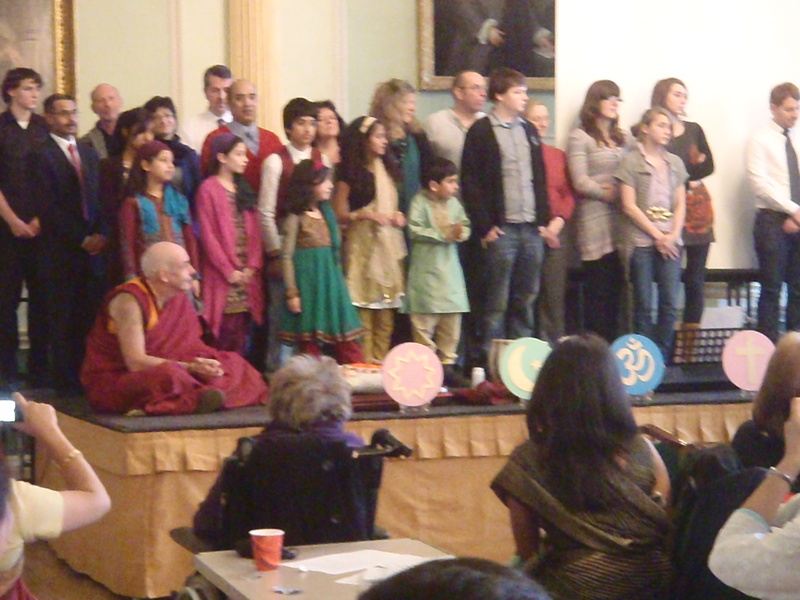 It gives me great pleasure to be able to share with you the write-up of the interfaith prayer meeting held in Bath on 5 February 2012. For the last ten years the Sai Baba organization, along with representatives from seven major faiths, have been asked to make a short presentation at this annual event in the splendid Guildhall. This year the theme was ‘Bath’s Industrial Heritage’ which was challenging to say the least! The Mayor opened the event and called upon the Mayor’s Chaplain to MC the proceedings. The Reverend welcomed the audience drawn from Bath and the surrounding region and expressed happy surprise that extra chairs had to be brought in, despite the snow, to seat the large number assembled. The Christian Youth representatives from St Saviour’s led the way by summarizing their activities and core values. They welcomed all to visit their church and enjoy their most valued sense of community and love of Christ Jesus. The Jewish tradition followed with a vibrantly sung prayer drawn from the Torah with a brief explanation. This was followed by Ruhi, a 4th generation Bah’ai who gave a brief history of her faith and heartfelt reading and song. Then came the Islamic faith group who led a question and answer dialogue, mentioning that there are between 1200-1500 Muslims in Bath and informing us of the local Islamic tradition of the city. They were followed by Arun Bedi from Swindon who led the Sikh tradition’s contribution. He explained the potency of the 2 primary symbols of Sikhism and the power of Aum. He finished by chanting and translating a prayer. Buddhism followed with another question and answer dialogue led by a monk from the Bristol Buddhist Centre, and then we enjoyed a beautifully sung Liberating prayer blessing in English. We were then treated to a sweet rendition of the Gayatri mantra and a bhajan led by Satyen Gadher and his group of young Hindu children who, in their beautiful colourful dress, lit up the proceedings with deep heart and respect. To close the proceedings and before we broke for tea and mingling came the Sai Baba group with our Sarvadharma. Knowing the Mayor’s love of song, we wanted to get everyone singing and so kept our presentation to a minimum, focussing on the Universality of Swami’s message and the commonality of His teachings with those of other traditions. Without God, without Love and without Service there would be no Industrial Heritage in Bath, regardless of the faith and beliefs of those who created this magnificent city. Happy are they who in friendship willingly work together …who in peace united willingly work together. And to finish, the rousing song Let the Love we’re sharing spread its wings, fly across the earth and bring new joy to every soul who is alive…Samasta Loka Sukhino Bhavantu…. 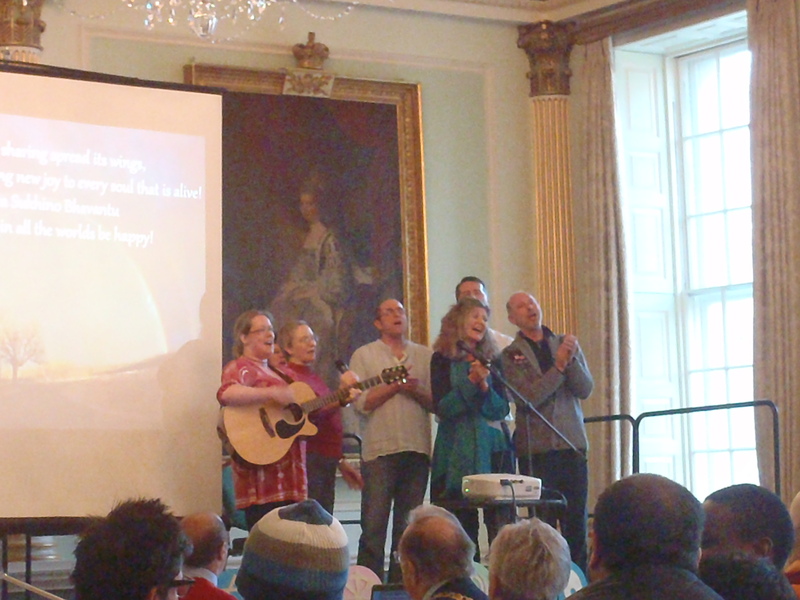 Afterwards, the Lib Dem MP of Bath, the Honourable Don Foster, who had been singing at the top of his voice, told Clare that he thought everyone in the UK should be encouraged to sing this song regularly…! The event aims to bring together all the various faiths so that the promotion of common values and purpose can be shared and felt. To this end much was achieved this year. There was a definite feeling of tolerance, understanding, mutual co-operation and appreciation of each other’s spiritual paths. It’s also a wonderful networking opportunity and most of us enjoyed interesting conversations with those from other faiths. A representative from the Islamic, Buddhist and Ba’hai groups have each accepted an invitation to come to our Sunday Study Circle to speak on a chosen theme of their particular tradition. This outstretched hand of welcome and friendship is as our Sai would hope and expect of us and we look forward to further extending this sense of sharing and openness to other groups. Roland Pargeter, Bath Sai Group. This entry was posted in From The Heart and tagged Bath Guildhall, Sai Baba, Sai Baba Group, Sai Baba organization, Sathya Sai Baba by Bloggin With Rich. Bookmark the permalink.